OUTRUN 2: EXCLUSIVE FIRST PS2 IMAGE! Thanks to our unbeatable contacts within Sega Europe, UKR was granted the world's first play test of the console version of OutRun2. Utilising Sony's cutting-edge EyeToy technology, PS2 OutRun2 places YOU in the driving seat like no other game! As our world-first screenshot shows, the feeling of PURE JOY generated by the combination of EyeToy and Sega gaming is astonishing -- and proof that the games giant is back on track. 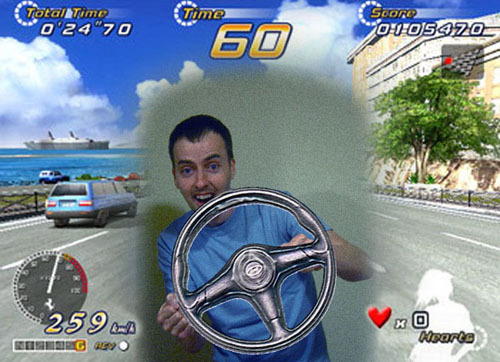 PlayStation2 OutRun2 uses EyeToy for mass-market appeal. 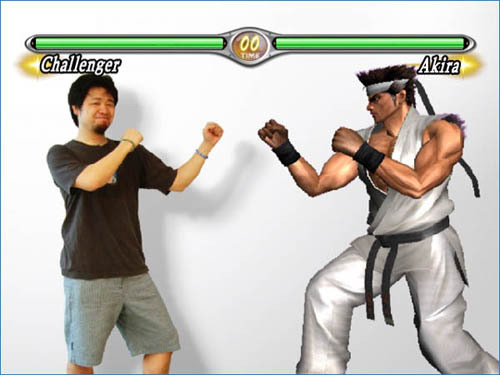 This isn't a Photoshop joke some idiot has made in five minutes to impress other idiots on the internet -- it's a REAL game. 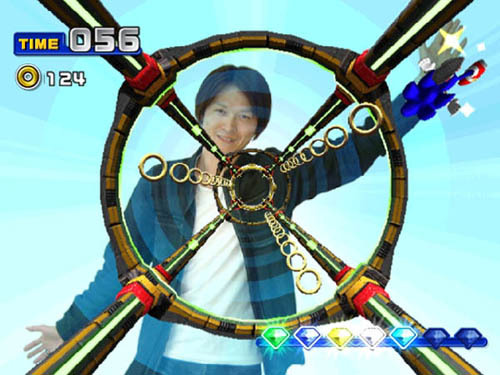 Sega Superstars, for EyeToy. From Sega. From SONIC TEAM. Yes, that SONIC TEAM. For EyeToy. If you look closely enough out of your window you can actually SEE the world dumbing down before your eyes, as a new wave of games that only require you to look into a camera, push your bottom lip out with your tongue and make spaz sounds into a cheap plastic webcam crushes all before it. This isn't a fake we made in 1997. It's fo' real. The future of video games is waving your arms around -- LIKE A RETARD! 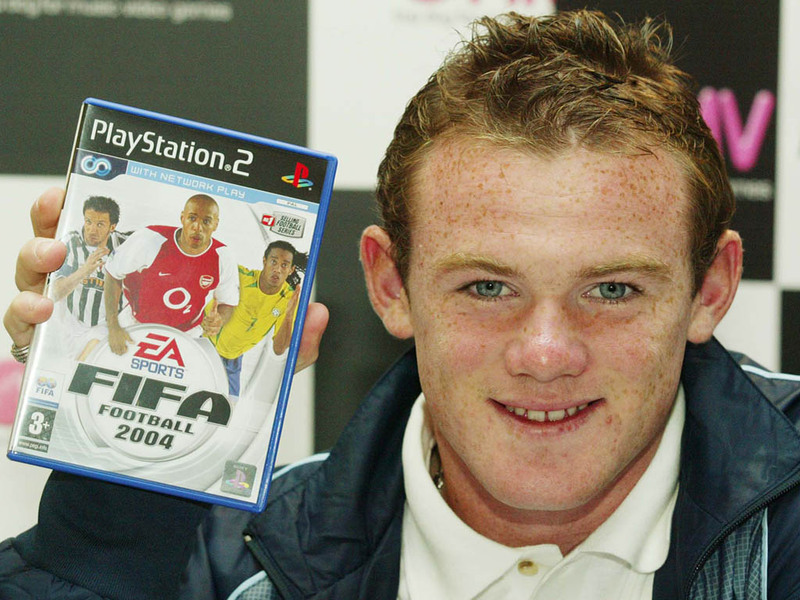 Our never-ending search for the sickest, filthiest, most degrading promotional photos took us to EA, where low centre of gravity superginge Wayne Rooney was secured for FIFA 2004 PR purposes. Presumably won over by the offer of a FREE GAME and a McDonalds afterwards, young Wayne beamed like only a marginally retarded footballing genius can when being told to hold something and look pleased about it in exchange for ten grand. "That's the girlfriend's birthday present sorted out"
Seeing as we aren't funny any more, why don't you send us captions for the above photo? Go on, be funny -- then pick one of these BRAND NEW DREAMCAST GAMES as your prize. Has your face just lit-up like Wayne's? See, we got a whole pile of old Dreamcast games still in their cellophane from Sega recently. We would've sold them for drugs but you don't get much drugs for Conflict Zone, even if it is still in its cellophane. So... say what game out of these you want when you submit your caption, and we really will send it out to the winner, even if you live in America (although you might have to wait six months for the bottle to float across the Atlantic). 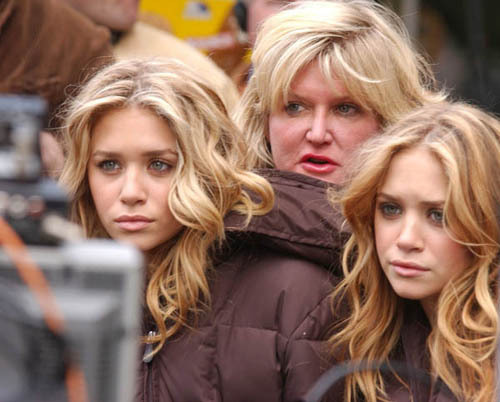 Which reminds us of the below photo we've been saving for ages, that shows the lovely twins (front) with their HIDEOUS HAG OF A MOTHER standing behind. This perfectly illustrates why Logan's Run was a good idea and why men don't often go out with women their age. Next time, girls, LEAVE HER AT HOME. 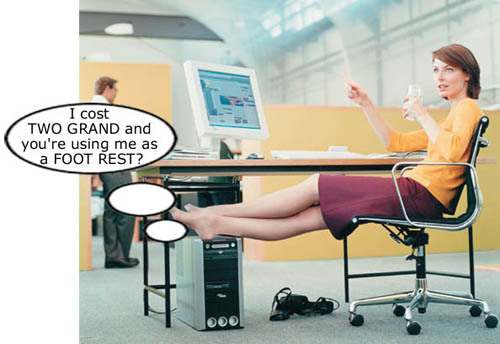 FUN WITH THE FUJITSU-SIEMENS PROMOTIONAL PHOTO ARCHIVE! We don't get tired of looking at press images. The thrill of looking into the eyes of the models, knowing that they're hating themselves, knowing they feel empty, knowing with ABSOLUTE CERTAINTY that they're regretting it and hoping no one will ever see the photos, never fades. Look at her. She's trying to mask it, but you can tell. She'll go home and cry, and won't even tell anyone why. Praise God you're not attractive enough to do this as a job.